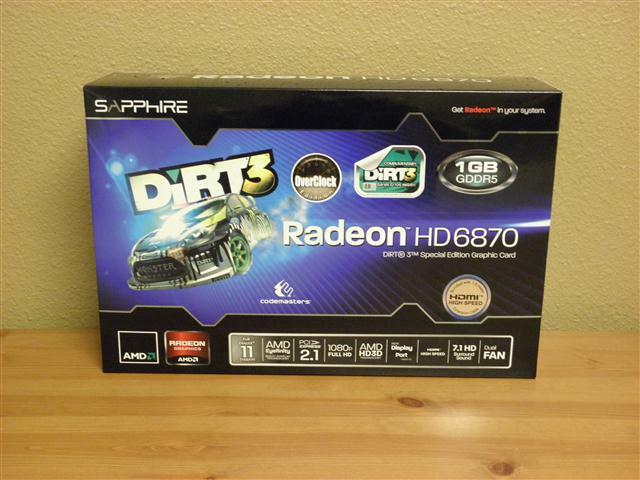 Sapphire has launched a new version of their mid-range video card, the HD 6870 Dirt 3 Edition, and they were kind enough to send one for us to review. 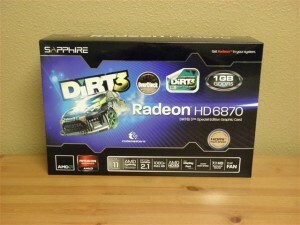 Sapphire is known for being one of the largest OEM manufacturers of AMD video cards. 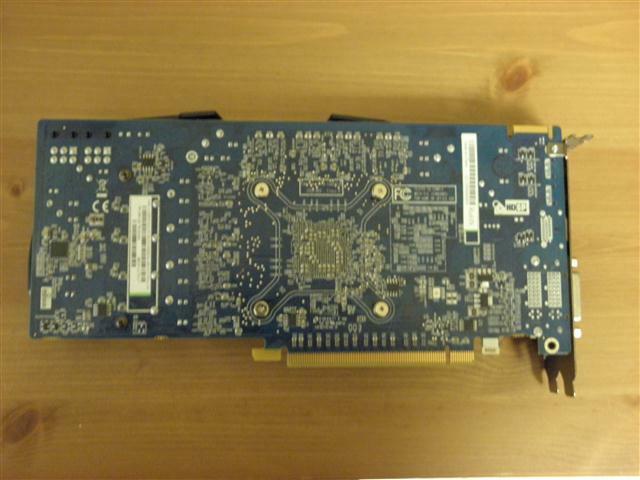 Are you in the market for a good quality and performing video card? Is price a large part of your decision making process? 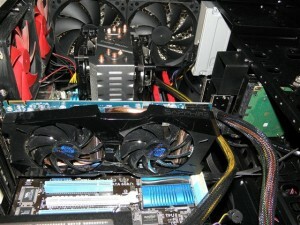 This article aims to answer these questions and more in your quest for a new video card. The 6870 is considered a mid-range card that is priced accordingly for its performance. Not all gamers can afford the high-end cards, but almost everyone can appreciate more performance. The 6870 comes equipped with 1120 unified shaders, which is actually quite a bit compared to its big brothers. The 6950 comes with 1408 shaders and then the 6970 with the maximum of 1536 shaders. 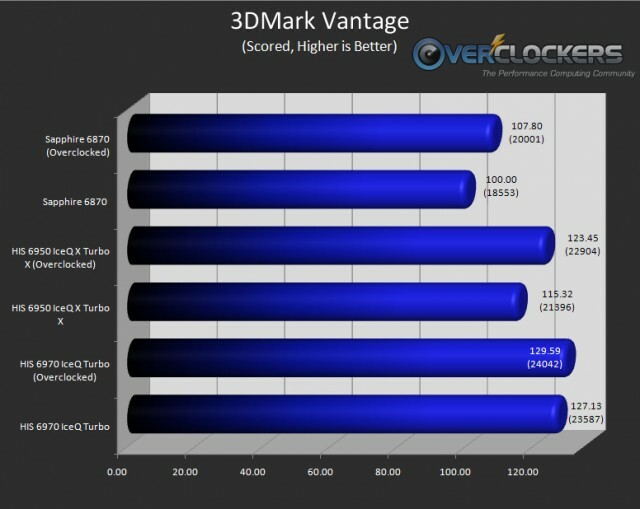 The 6870 looks to be placed in just the right price and performance bracket to be quite attractive to a large portion of the PC gaming consumers. 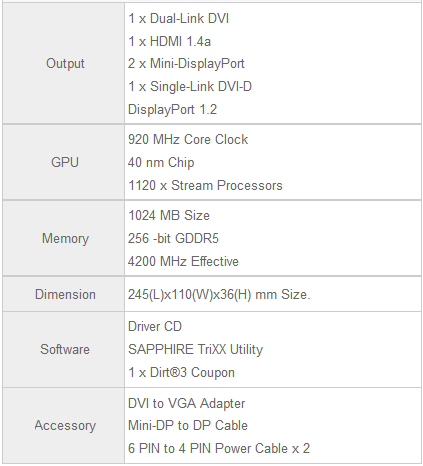 Here we see a snapshot of the actual video card specifications. 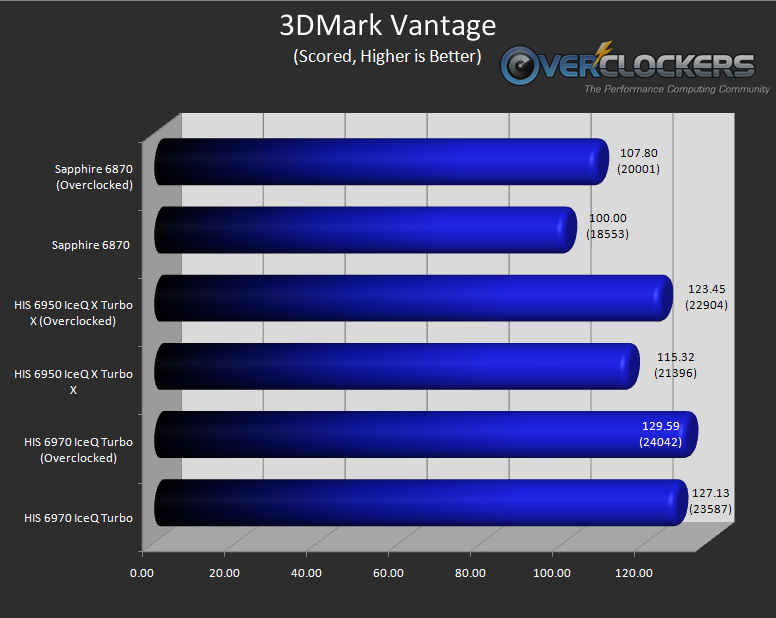 The core is factory overclocked to 920 MHz and the memory is set at 1,050 MHz. As you can see, the program that I am using is the Sapphire TriXX overclocking software that was included with this card. This software is very user friendly and very easy to use. Let’s begin with some shots of the retail box and product specifications. Here are a couple shots of the whole retail package. I must say that Sapphire has included a large selection of useful add-ons. They provided two CrossFireX bridges and a free game coupon for Dirt 3 along with a plethora of other goods to enjoy for your gaming pleasure. Next, we have some shots of the card. It is not as large as the 6950 and 6970. I also like the blue PCB, and the twin fan configuration is very pleasing and adds to the aesthetics of the overall card. This is a very nice looking card and should compliment any windowed case that the end-user might have. 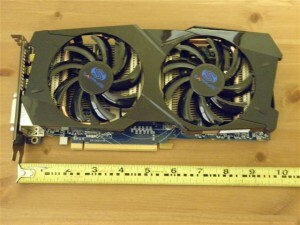 The length of the card should fit most mid-tower cases coming in at 9.75″. 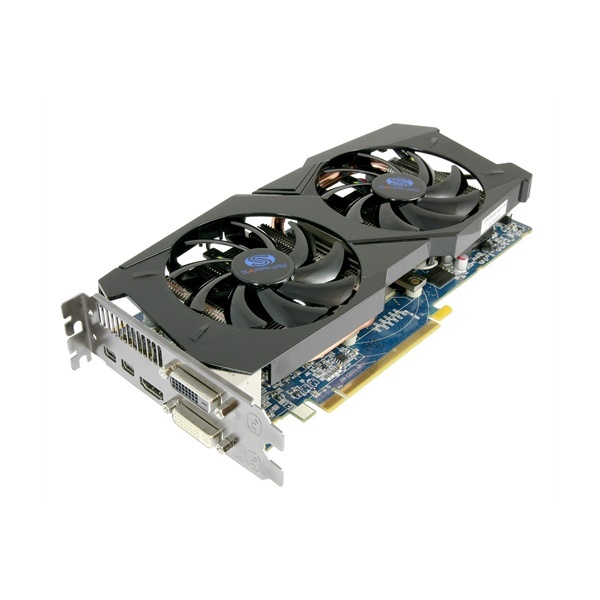 Sapphire has provided a wide variety of video output choices with this particular card. You have two DVI, an HDMI, and two mini-DisplayPorts that provide the end user with many video display choices. Now we get to the nuts and bolts of this review. My subjective thoughts on this card after using it for around a month are good. It feels like it performs closer to a higher end card like my 6970, yet the objective numbers place this card right in the middle of the road performance wise. To be honest, if I did not have FRAPS staring me in the face during testing it would be hard to tell if I had a 6970 or a 6870 in my rig. This, of course, is my personal opinion. I wanted to provide a subjective view to contrast along with the objective facts that this review has produced. Unless specified, all tests were completed at stock clock frequencies. 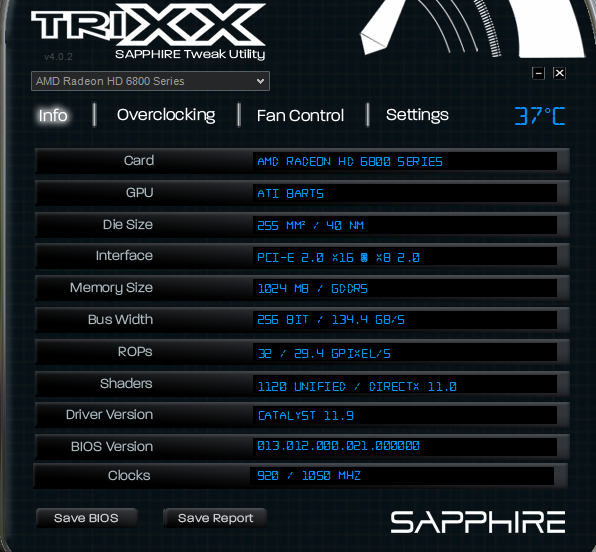 I did not overclock my CPU, but did overclock the Sapphire 6870. All video card overclocking was done without adjusting voltages. To find max core and memory clocks, I ran the card through Furmark until I discovered the stable overclock for both GPU and memory frequencies. 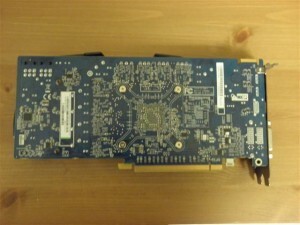 The stock clocks on this card come equipped at 920 MhH core and 1050 MHz memory. 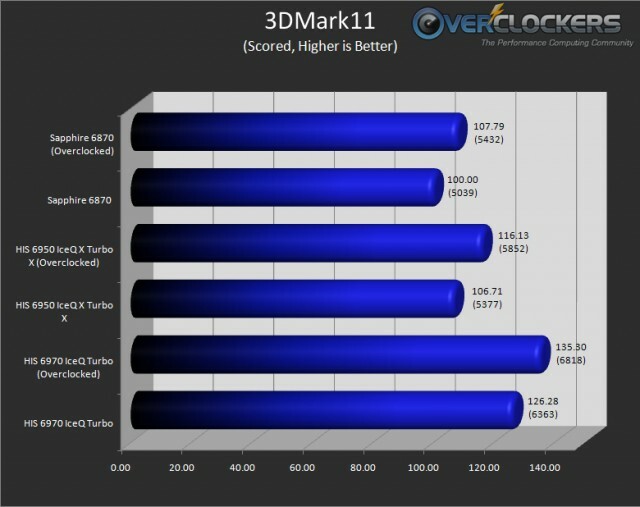 The highest stable overclock that I achieved was 1005 MHz core and 1120 MHz memory. That is a 85 MHz increase on the core and 70 MHz on the memory. 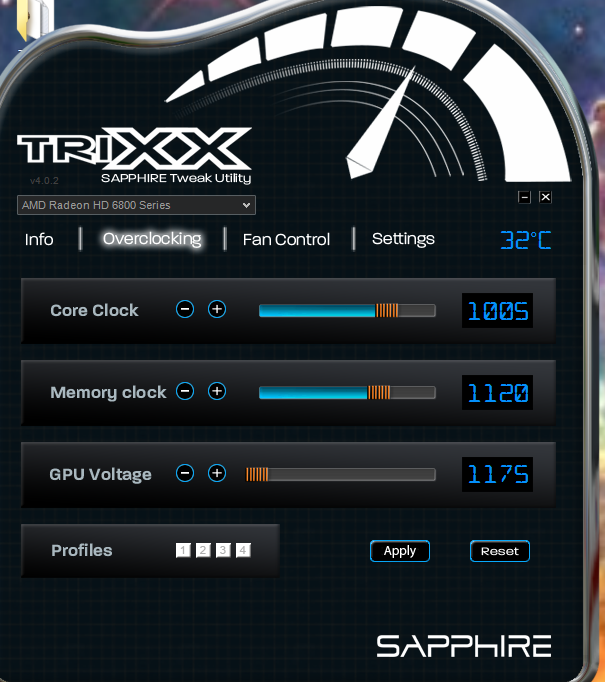 That is very impressive seeing that this card is already factory overclocked. Reference 6870 frequencies are 900 MHz with 1050 MHz respectively. Editor’s Note: The graphs below are all normalized to the stock Sapphire 6870 speeds. 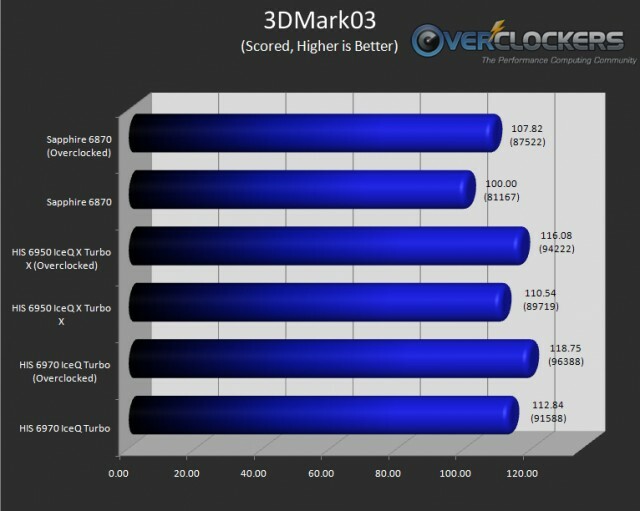 The Sapphire 6870 at stock is always 100% and all other results are expressed and graphed as percentages relative to its score/FPS. The actual benchmark results are in parenthesis below the percentage. 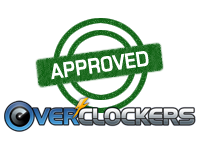 The next set of tests were run on stock clocks and then again at the overclocked speeds of 1005/1120. You can see some performance increases, but really not enough to write home about. 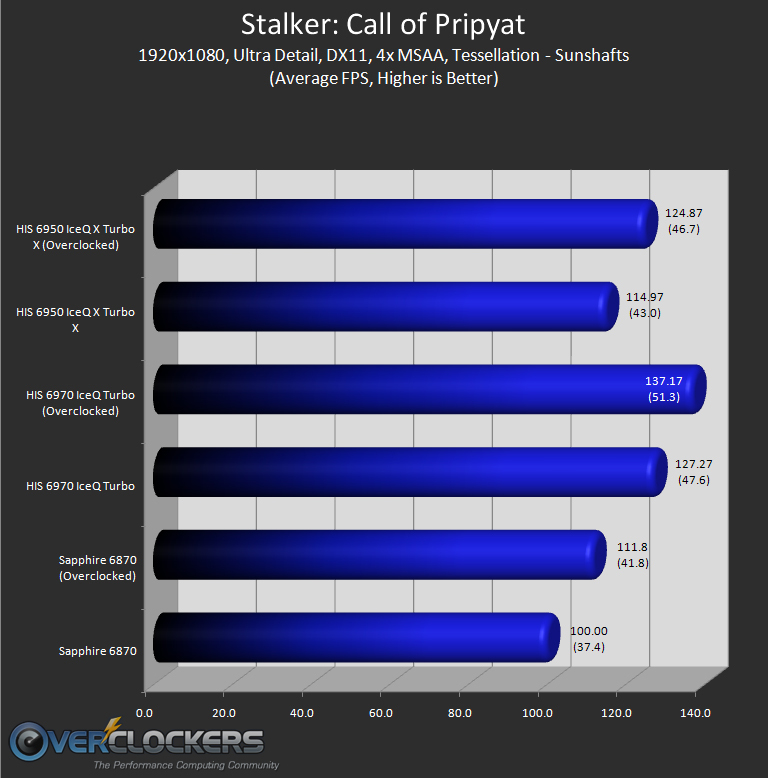 The benching suite for this round of tests is comprised of Stalker: Call of Pripyat and Heaven HWbot “Extreme.” As you can see of the video cards in this compilation of test runs, the Sapphire 6870 is the least powerful of the group. Yet, as one would expect, when the tests are set lower (4xAA) the Sapphire offering holds fairly close to its bigger sibling the 6950. 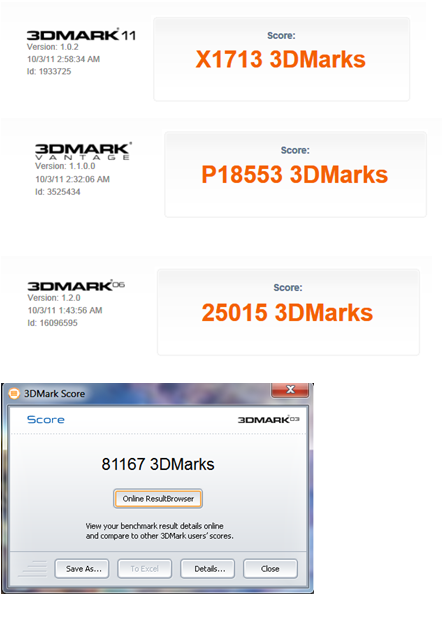 In the Heaven benchmark, you can see the distance begin to lengthen. Mind you this is a mid-range card and in my opinion it does quite well for what it is. HWBot Heaven is a pretty tough test for video cards. 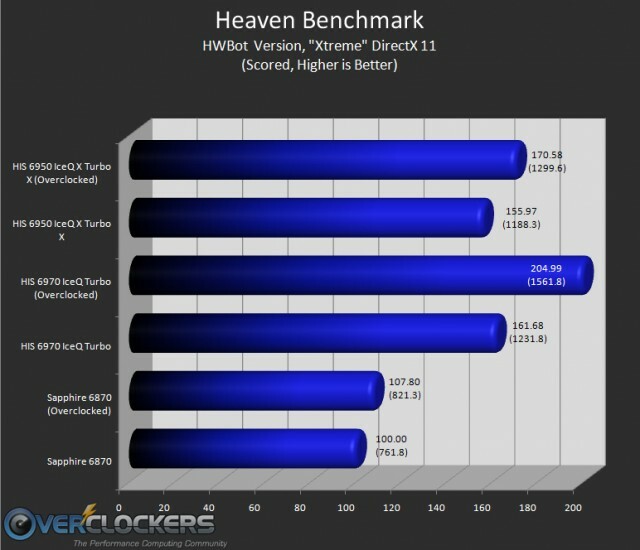 HWBot Heaven was released in Aug 2010 for DirectX 11 testing. I have selected DirectX 11 and “Extreme” settings for this run of tests. See for yourselves how it stacks up. 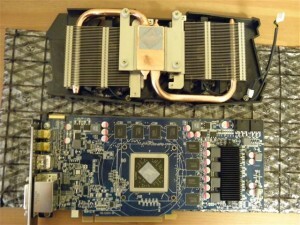 The cooling solution that sapphire has used for this card is very substantial. It is a twin fan configuration paired with the industry proven heatpipe system. This in turn is coupled with Sapphire’s own bleeding edge cooling technology called Vapor-X. Follow the provided link for more detailed information about Sapphires Vapor-X technology. I removed the heatsink fan assembly for further inspection. The copper core was a little rough. There were small machined grooves that I could see with my eye and feel as I brushed my fingernail across the surface. It was not polished as one would expect. The cooling performance of this HSF assembly would increase if the copper core was given a polished surface. Yet, aside from that, the Sapphire HSF works very well as is. I have provided a shot of the card installed in my main rig, which looks good and fits well in my Antec DF-85 full tower. The cooler performed very well and is well built. The overall appearance of the card with the twin fan cooler is very appealing. It is a nice looking card and should compliment any windowed PC case. 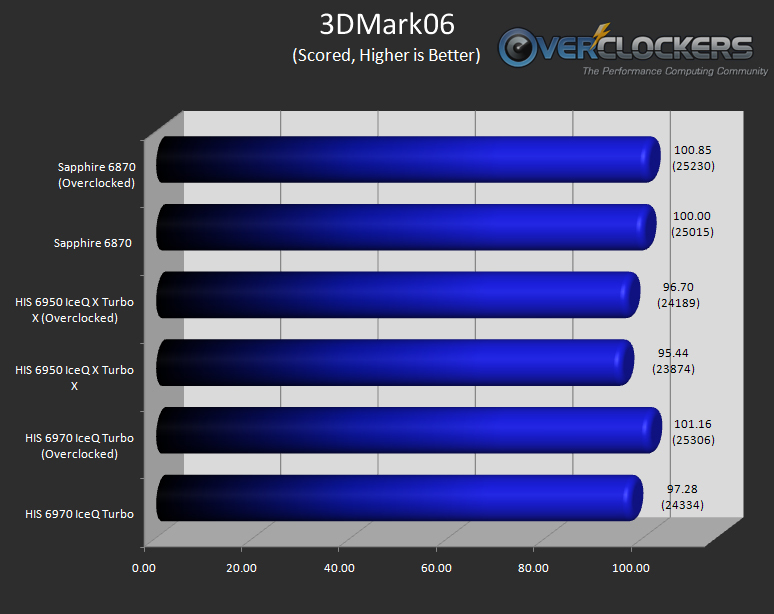 I ran the card through 15 mins of FurMark to get the GPU nice and hot to simulate the most stressful usage situations. As predicted, the cooling unit performed excellently. Ambient temperature was recorded at 18 °C (65 °F) as it stays pretty cool here in the Pacific Northwest. 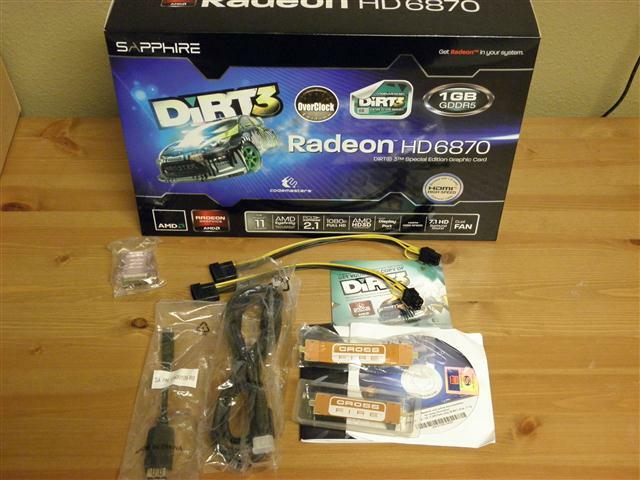 During the time this review was written the Sapphire 6870 Dirt 3 Edition video card was listed at $209 with a $20 MIR at newegg.com. The pricing reflects the mid-range that this card is targeted for and the performance is right about where it needs to be. I also thought the cooling solution was very good. The copper base of the unit needed to be polished for optimal results, however it still performed very well. The two fan configuration of the cooling unit helped quite a bit in keeping the GPU cool even under load. At a price tag of under $200 and a GPU with 1120 shaders this card is an excellent choice for those who do not want to shell out top dollar for a top card, but also expect to get a good degree of performance. 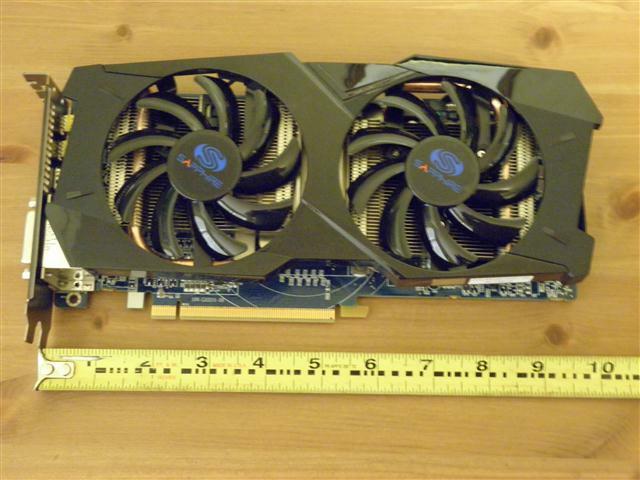 I would recommend this card to anyone who wants an excellent mid range video card. Nice job on the review krag! These 6870's sure are a solid bang for your buck card! I was very surprised at how well this card stacked up to the 6950 & 6970 cards. 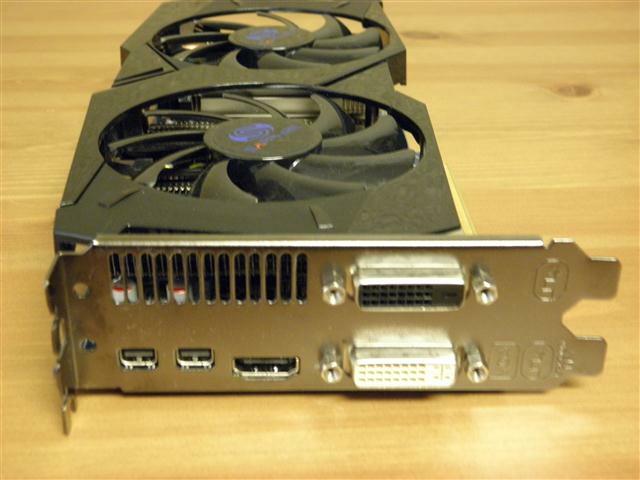 2 of these 6870's in X-fire would satisfy anyone.